SHIPPING - $ 5.59 !! Bulk-10 (10 Feet Bulk) � Ten feet of latex tubing. No more than 4 pieces and each piece will be a minimum of 2 feet in length. Available in all stocked sizes. Bulk-25 (25 Feet Bulk) - Twenty-five feet of latex tubing. No more than 6 pieces and each piece will be a minimum of 3 feet in length. Available in all stocked sizes. Bulk-50 (50 Feet Bulk) - Fifty feet of latex tubing. No more than 8 pieces and each piece will be a minimum of 3 feet in length. Available in all stocked sizes with an outside diameter 1 inch or less. Bulk-100 (100 Feet Bulk) � One Hundred feet of latex tubing. No more than 12 pieces and each piece will be a minimum of 3 feet in length. Available in all stocked sizes with an outside diameter � inch or less. © Copyright 2011-2019 Latex-Tubing.Com. All Rights Reserved. Website designed and developed by teotl_developers@yahoo.com. Thank you for visiting our Latex Surgical Tubing website. 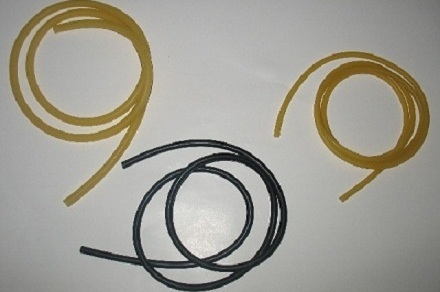 Your online source for Latex Surgical Rubber Tubing. We offer rolls in either 10 or 25 foot lengths. PLEASE VISIT OUR NEW WHOLESALE WEBSITE --- CLICK HERE !! !